High borrowing rates are a relic. Canadian regulators may soon force borrowers to qualify at interest rates two percentage points above the contract rate. With many posted mortgage rates now approaching and even surpassing 3.00% (depending on the term), this means borrowers will soon need to show they can afford payments based on rates of 5.00%+. The justification is that regulators want Canadians to be prepared when interest rates rise, but that’s a hollow excuse. It’s a punitive macroprudential rule that is disconnected from reality. Interest rates can only rise if inflation accelerates, but every force in the world is pushing in the other direction. We’re in an age of no inflation and it will completely change borrowing, lending and how the mortgage market works. There is only one kind of inflation that matters to the Bank of Canada: wage inflation. Prices might rise on everything for a year or two, but if wages don’t go higher with them, the cycle hits a wall because people won’t have the money to pay those higher prices. Demand falters and prices flatten. The simple Economics 101 model is supply and demand. As the economy grows and companies expand, the supply of idle workers eventually runs out. That means more bargaining power for workers and wages rise. It’s something the Bank of Canada calls the “output gap” or “slack”. This paradigm is now forever broken. The first reason why is that globalization means the supply of workers is no longer limited to where you are. Factories and many service industries can move to where workers are cheapest, and until there are jobs for the billions of workers on the planet there will always be slack. Even if all those workers could find jobs it still wouldn’t matter because automation is a far bigger driver of disinflation. Workers everywhere are being replaced by technology. It’s not just robots, but also computers, algorithms and improved processes adopted from abroad. We are still in the very early stages of this change and it’s accelerating daily. Add in de-unionization, Amazon-style competition, precarious labour, other technology and the lingering collective psychological shock of the financial crisis and it’s a Quantitative Easing-miracle that prices haven’t fallen already. This isn’t just a Canadian phenomenon. It’s not even a developed market phenomenon; inflation is low virtually everywhere. Even emerging markets that are growing far faster than Canada’s economy aren’t generating runaway inflation. China’s economy continues to grow at a nearly 7% annually, but inflation is just 1.8% and has been below 3% for four years. Average mortgage rates for homebuyers there remain under 5.00%, and until rules were tightened this year, borrowers were typically paying less than 4.00%. The second reason that rates will never rise to beyond 5.00% in Canada is that there are now far too many people who wouldn’t be able to make their payments. The government’s last round of new mortgage rules was a noble effort to reign in the housing market, but the horse has already left the million-dollar barn. Many borrowers would be forced to sell their homes, and those who could afford to stay would have their spending power cut dramatically. A two-percentage-point rate increase on a $500,000-mortgage boosts the payment by at least $500 per month. A 5.00% rate on a million-dollar mortgage means $50,000 spent per year in interest alone. That’s a devastating bite out of a household’s disposable income, which is crucial for sustaining the economy. Canada is often described as a resource economy, but it’s far more dependent on the health of the consumer than the price of oil. If consumers begin to suffer, it will quickly show up in the economic data and the Bank of Canada would be forced to do a quick U-turn on rates. Even if Canadians could afford those higher rates, it would be a disaster politically for any governing party. Making people feel poorer is a sure-fire way to find yourself voted out of Parliament. While there is no inflation in the classic sense, prices are rising. You don’t need to look any further than soaring real estate or sizzling global stock markets. The crux is that there are two types of inflation. There’s the classic consumer inflation, which is tied to industrial, commercial and labour prices that are doomed to stay low forever. Then there is asset-price inflation. Low rates have changed the economics of borrowing and investing. If you can borrow at 3.00%, virtually anything that returns more than that is a viable investment. So asset prices rise until even meagre returns are no longer economical. Add in scarcity, tighter land-use rules, foreign capital and the growing desire to live in urban centres and it’s a perfect storm for housing. Ultimately, this is a big political problem. People want to live in cities and it’s unpopular for voters to be spending all their money on mortgage payments. It’s also bad for business to have workers commuting unreasonable distances. There are two real solutions and two that governments will try first. The ultimate solution to high house prices is to make it easier and cheaper to build more housing. That’s politically unpopular now but could change someday. For now, governments continue to make it tougher to build the homes people want at prices they can afford. The other way to cool house prices is to raise interest rates, however that’s far too blunt of a tool. Forcing businesses or rural homeowners to borrow at higher rates would be an unnecessary blow. The Bank of Canada has already gone too far. The two solutions governments are trying first are the two things they always do in a market crisis: blame foreigners and blame the speculators. So far the execution has been sloppy, but politicians have sent a powerful signal that they are now part of the equation. So don’t worry about interest rates, worry about what’s coming from regulators. Thanks for the laugh - great start to the weekend! Makes we wonder where the politicians were when prime lending rates hit 22.75% in 1982. There was plenty of pain when people were losing their houses back then. But of course ... “it’s different this time”. Lol! It is different this time, 30 years of fractional lending and a ever increasing money supply. All the deficit spending the government is doing, they will need to pay accordingly as well to a increase in rates. Take a look at 1982 vs now, its like in the US. Rates will never raise up to high because it would destroy their own government. If you knew how money is created in the fiat system you would understand that interest rates will never EVER again raise up very high it today climate of high government debt. Who cares abou US debt. 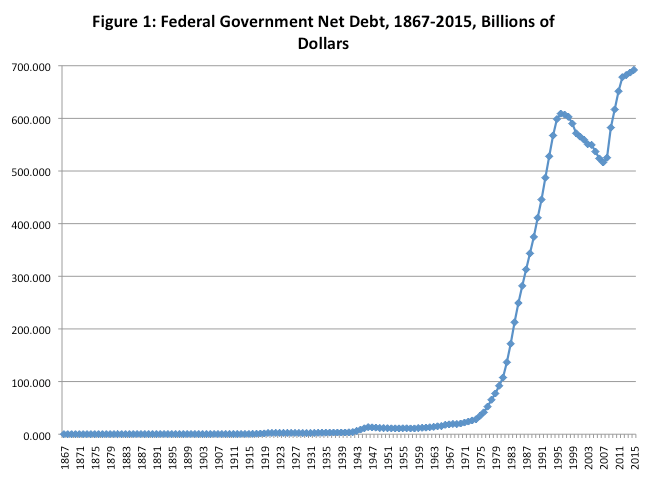 Unfortunately that is a graph of Canadian federal debt. My comment was a jab at ETB. Anyways - will we get to 20% again? Not in my life. But the article suggesting 5% is impossible is completely comical - then look at the source of the article. No self serving there. My guess is ETB is praying rates don’t rise because theyy are leveraged more than they would like. “However, the bank says while its still-low interest rate of one per cent will likely rise over time, the governing council will remain cautious when it comes to future increases. Lol interest rates are going no where fast. Not sure what you mean they are going no where fast? Market has already baked in another .25% increase at the next meeting - past that, the Bank of Canada is making it pretty obvious that we should be prepared for rates to go up. Probably up another .75% by this time next year (at least). Why do you think the OSFI is making sure everyone qualifies at a higher interest rate going forward? Seems pretty obvious to me. Hey - I could be wrong. Won't be the first or last time. Gouverment policy trying to control housing pricing is smoke and mirriors.The illusion of due diligence. Foreign buyers tax? Why not out right ban foreign ownership. Conventional mortgages must qualify for higher rates? These mortgages are already the highest quality and least likely to default. Realestate is only one piece of the pie, vancouver and toronto is a even smaller piece of that pie. As i mentioned before, raising interest rates also increase their own payments on their own loans. The gouverment is the biggest borrower of money. They will not slow down realestate with brings in $$$ and raise rates so they need to spend even more $$$ they wont have to service debt. Its not good buisness. Its not in the gouverments best intrests to slow down RE which is a cash cow. They are just pulling wool over the sheeps eyes to make it seem like they care. Elected officials make enough $$ housing crisis dosent personally effect them. I think this is a lot of wishful thinking on your part. And sorry - which government policy is trying to control real estate prices? Not the Bank of Canada takes into account the entire economy, not just housing market. Not the OSFI. Their mandate is not to control real estate prices but protect confidence of the banking system. So again, I ask which government policy is controlling real estate prices? I think a LOT of people are overextended and terrified of rates increasing - you sound like one of them. Who is trying to talk the market down? Rates are going up - it is obvious to anybody with eyes. I don’t know why anybody would cry about this - generally it means the economy is doing well and people are making money. Well I guess one reason people would cry is because they are over leveraged - perhaps that sounds familiar to some of our fellow posters. But none if our posts have any impact on the market - if they did condos would be crashing (they aren’t) and the stock market would be falling (they aren’t). Must be hard for ETB to wake up wrong every day. Just to be clear, I just locked in a fixed rate for my last 5 years of my mortage. It could go to 2000% and it would not affect me 1 bit. I understand the idea that those who are in a over leveraged situation are praying the interest rates are biased and tend to lean one way or the other. I’m trying to speak from a unbiased stance, interest rates are rising but barley, its almost symbolic. .25% here and there and this last announcement no rate raise and I posted the feds wording. They left lots of room for leaning left or right. They did not use any solid wording.